We’re always looking for a way to cram more veggies into breakfast, and kale is one of the most nutrient-dense veggies on our shopping list, so this recipe is a win-win. Thanks to Leigh for the submission. 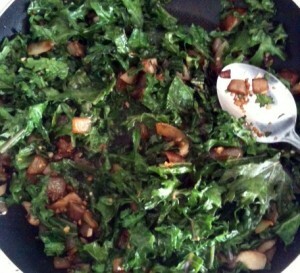 Kale, mushrooms, garlic and onion. Cut off kale stems and discard, then wash kale leaves and dry well. Pile kale leaves up on top of each other and cut into strips about 3/4 inch wide, then turn cutting board the other way and cut again so you have squares just under an inch square. Chop onion into pieces about 1/2 inch. Heat coconut oil in frying pan, then add onions and saute 5 minutes (or until the start browning). Add garlic and mushrooms and saute about 3 more minutes, then add kale, turning over as it wilts and sauteeing about 5 minutes, or until kale is significantly wilted and softened. Put sauteed vegetables into large mixing bowl and add beaten eggs, and Italian seasoning and salt/pepper. Stir gently until ingredients are well distributed. Use a small amount of coconut oil to coat the baking pan, and pour in egg mixture. Bake 25 minutes until eggs are well set and the top is lightly browned. Serve hot. The final dish, perfect for breakfast OR breakfast-for-dinner. Got a delicious, simple list of ingredients for our next Friday recipe feature? Send your Steal This Meal entry (along with photos and YOUR Whole30-inspired story!) 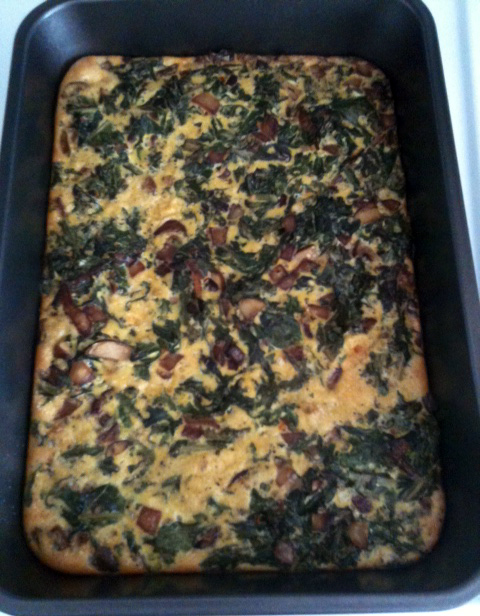 to recipes@whole9life.com. And if you’re looking for more delicious recipe ideas from Whole9 and our readers, just select the Recipe category under the 9 Blog header! Kale is my new favorite green stuff :) I will be making this tomorrow morning! YUM! Made this a.m. and oh so good. My 16 month old son gobbled it up and even my non-paleo mom loved it! Looks great! Would you cook the quiche for a shorter period of time if you were planning on using this for several days of breakfast and reheating it? @Bo: You don’t want the eggs to be runny when you pull it out of the oven for the first time around, but you don’t want to cook it to death either. I’d say cook it on the lighter side initially (so the eggs are set but not too firm), and then use your oven or microwave to heat it up as left-overs. That way, you’ll be sure your finished product is never tough or rubbery. Just popped this out of the oven, and it’s excellent.